That Man from Rio: Fans of adventure style romantic comedies like Romancing the Stone, To Catch a Thief and Indiana Jones and the Temple of Doom will enjoy this film. Jean-Paul was still quite young in this early non-arthouse film. He's basically a grown up Tintin running from high class hotels to the slums of Brazil to a million dollar mansion and, ultimately, an unforgiving jungle all in the pursuit of a girl and some treasure. The film starts off with a rare statue being stolen followed by Belmondo witnessing his girlfriend's kidnapping and giving chase. From there the action hardly let's up. He follows where the clues lead him in order to unwrap this globe-hopping mystery. It ends up in a cave a looking a little like the opening scene in Raiders of the Lost Ark. 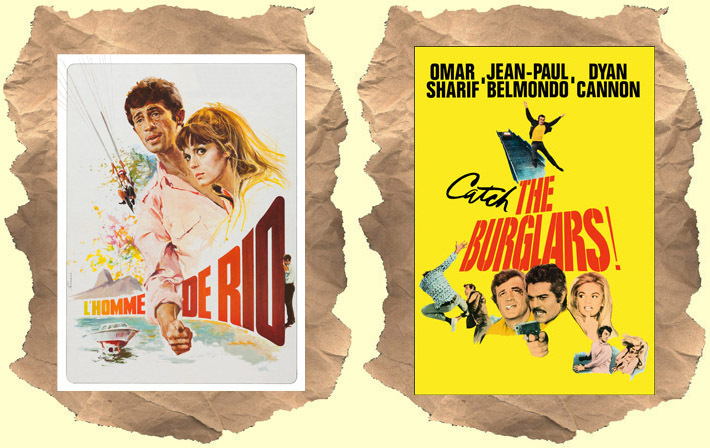 There are speedboat chases, a plane ride, car chases, an all-out brawl in sleazy bar and, as usual, Belmondo does all his own stunts. It really is like a live action Tintin story. Plenty of thrills and humor in this one. Highly recommended. In spoken French with English subtitles. WIDESCREEN.